The HQ-100A is fun to operate as is, but when I saw the updates in the HQ-200, I decided to add a product detector to it. It was certainly an improvement. Years later, I came across the AVC mod by WB6PUS. This made the radio more enjoyable. Added a product detector by duplicating the circuit from the HQ-200. The HQ-200 is almost identical to the HQ-100A, except for its product detector. A 6BE6 was installed in place of the 6BV8. A BAT46 diode was used as the AM detector and a 1N4148 for the noise limiter. The BFO signal from 6BE6 was leaking back to the AM/AVC detector, causing a constantly high AVC voltage to develop. This is not an issue, if the AVC is off when receiving SSB. But I didn't like that, so a JFET based simple BFO circuit was added at the front panel BFO control, utilizing existing components. This minimized the BFO leakage. Added an external mute control. 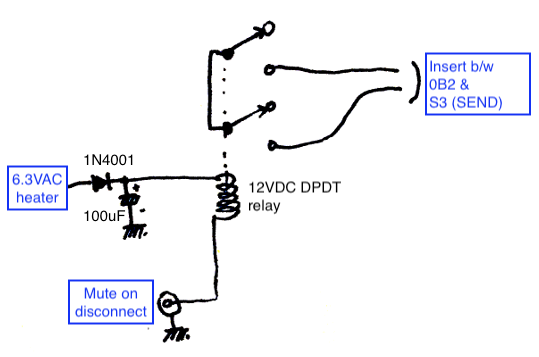 This is to mute the receiver when a transmitter is transmitting. This achieves the same function as the SEND position. It cuts the 105V regulated supply to the screen grids, the BFO and the prod detector. The 6C4 HFO is always on. Modified the AVC for better SSB reception. 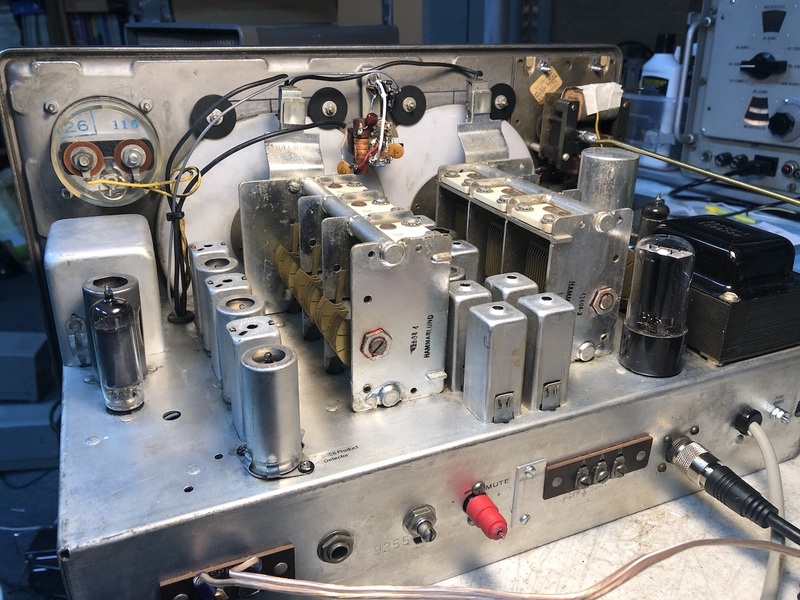 This mod was originally developed by Curtis (WB6PUS) for the HQ-160. 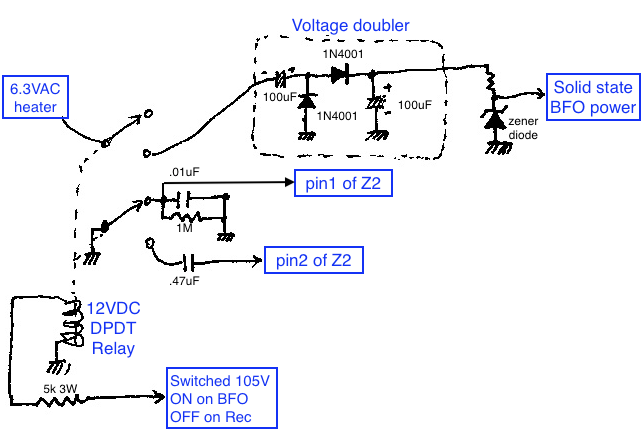 As an identical Z2 network is used in the HQ-100A, it was easy to adapt this for the HQ-100A. The AVC mode is switched automatically by a relay. As you can see, a 6BE6 is used instead of the 6BV8. 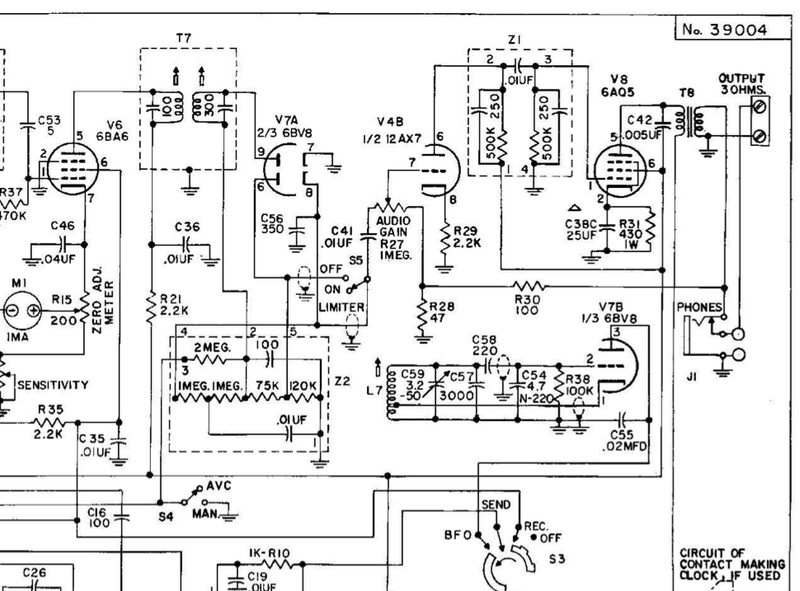 AM detector/AVC rectifier is a 1N34 and a 1N541 silicon diode is used for the noise limiter. The mod by K3JLS uses two 1N34, but I used one BAT46, which is known to be an excellent AM detector with the PIV rating of 100V and a very low Vf. For the noise limiter, a 1N4148 was used. 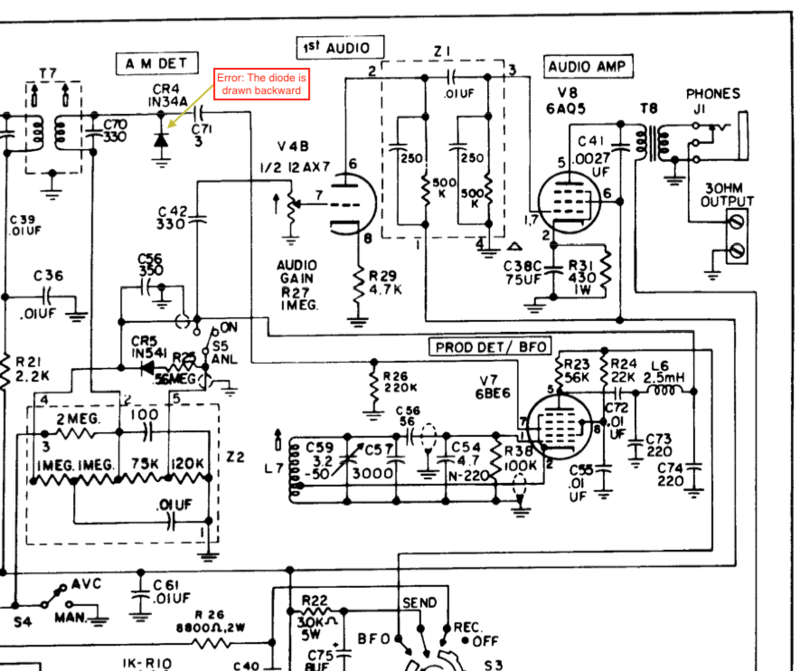 Note that the AM detector's polarity is backward in the diagram for the HQ-200. It was soon discovered that a sufficient amount of the BFO signal developed in the 6BE6 travels back to the AM detector. This caused a high baseline AVC voltage. It was determined that a separate oscillator is needed. Instead of making a hole and adding another tube, I opted to add a small solid state circuit where the BFO coil and cap are. The power was initially provided by dropping the 105V from the mode switch through a 10K ohm resistor. The BFO circuit had a zener diode for regulation. This arrangement worked well until I decided to do the AVC mod years later. The 105V supply was getting overloaded, so I had to find other source. I ended up adding a half-wave voltage doubler/rectifier to the heater supply. I came across the AVC modification designed by WB6PUS for the HQ-160 years after my initial product detector addition. It is very simple but effective. Basically a capacitor is added to the input (pin2 of Z2) and a resistor is inserted between pin 1 of Z2 and ground. The trick is to switch them out when in the AM mode. I settled with a 0.47uF and a 1M ohm and a relay for switching. I ended up using a relay for switching the AVC mode. The relay is energized when the plate of the 6BE6 is on. 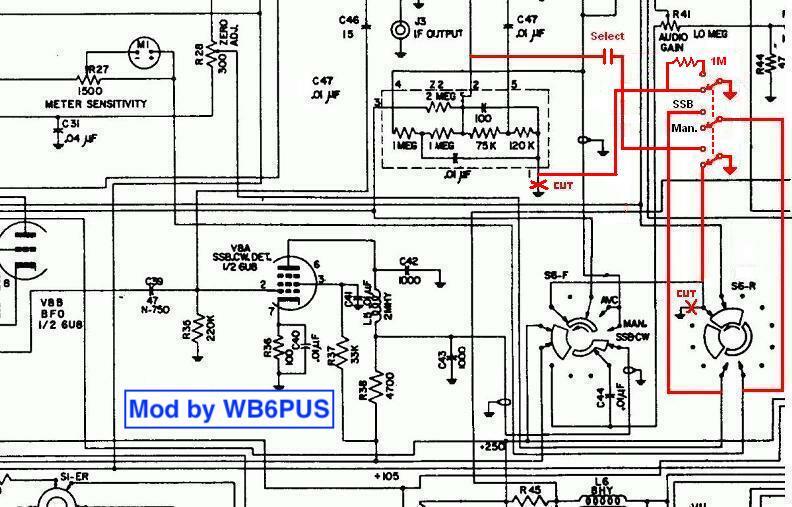 This is when the mode switch is in the "BFO" position. I used a 5k ohm dropping resistor to get an acceptable voltage for the relay. It will be different for a different relay. Mine is a typical 12VDC DIP signal relay with a 650-700 ohm coil. A 110V relay (10k ohm coil) may be used directly without a voltage dropping resistor. But they are much bigger. This relay also switches the 6.3VAC to the half-wave voltage doubler for the solid state BFO power. 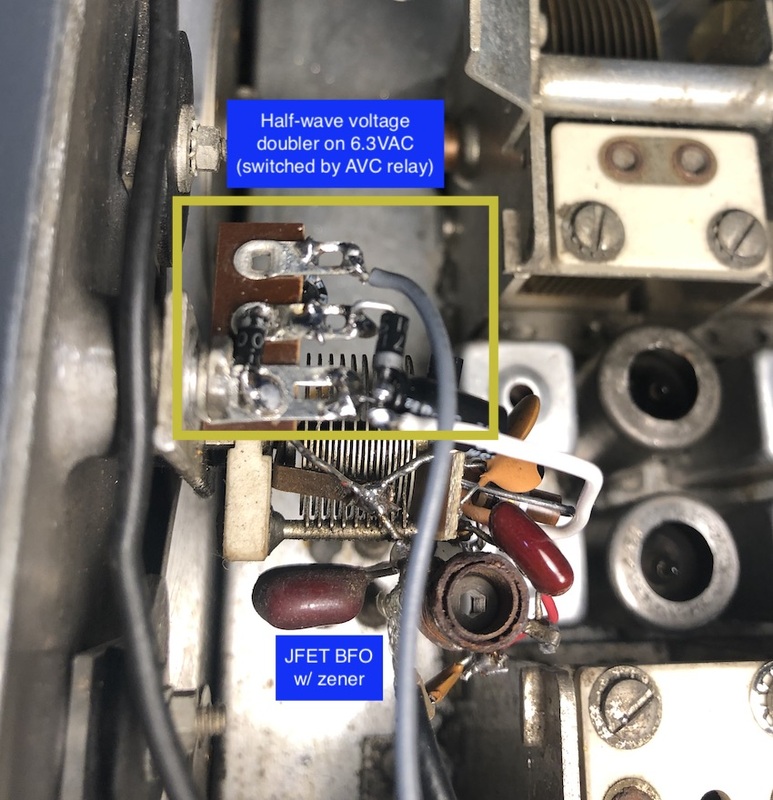 If the BFO power is directly tapped from the 105V line, the current draw will be too much and further changes will be needed. 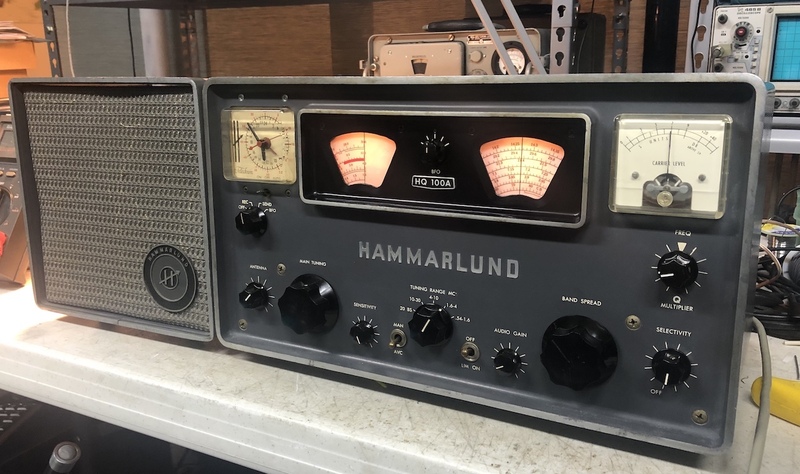 For SWLing, this is not needed, but for hams who want to use the receiver in QSOs, this is a must. It is nothing complicated. An RCA jack was added in the back. If the RX is not completely muted with this, one pole of the relay can be used to silence the audio output. Make sure there is a load (e.g. 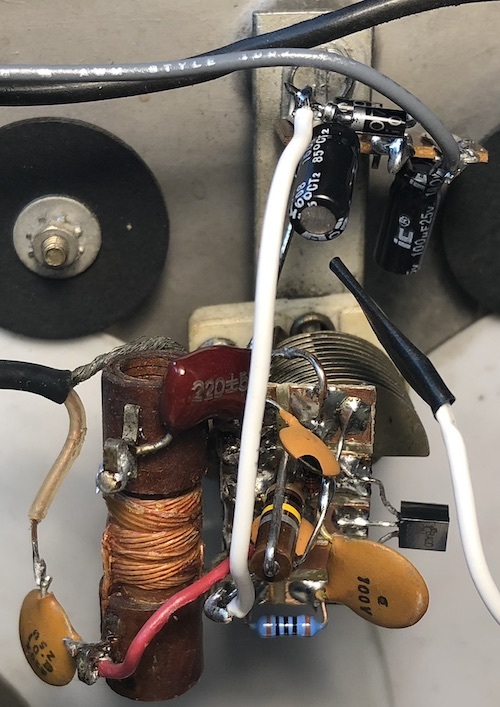 1k ohm) still connected to the secondary of the output transformer. The voltage dropping resistor is actually 5k ohm. 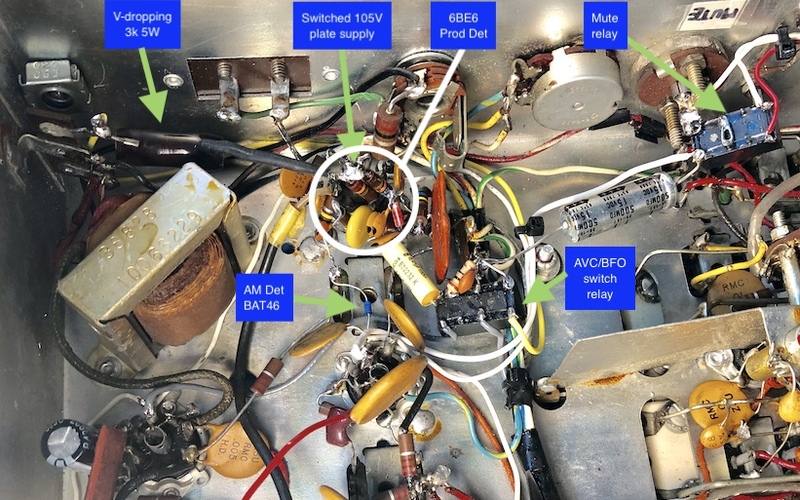 The yellow tubular capacitor is the 0.47uF in the AVC. The presence of a 5Y3 means it is an early version of the HQ-100A. 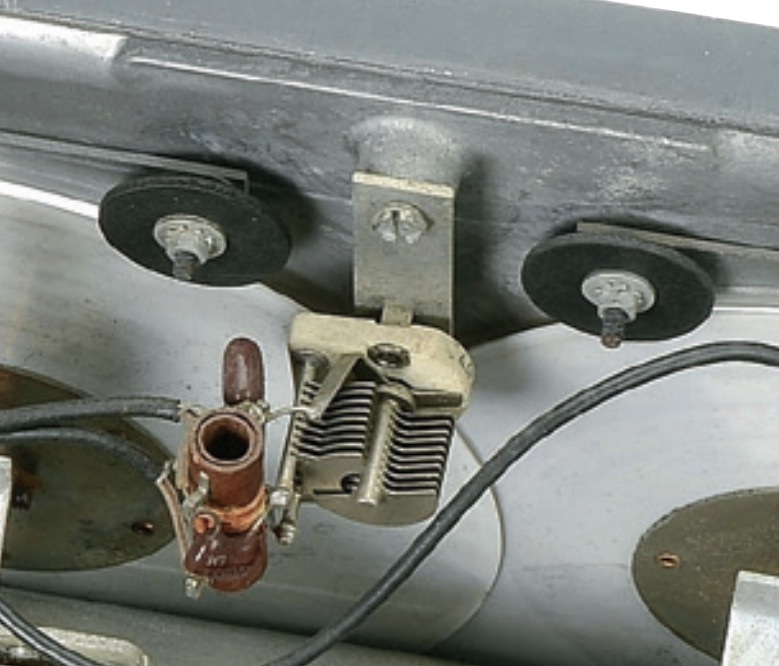 The next version had a 6CA4 rectifier. The last version used solid state diode rectifiers. 8. How well does it work? The following video demonstrates the effectiveness of mods. In the first segment, I turned on and off the AVC mod. You can see the change in decay timing and the resulting audio quality improvement. Turn on the caption (CC) to see when it is on or off. For further improvement, you can add an active AGC.